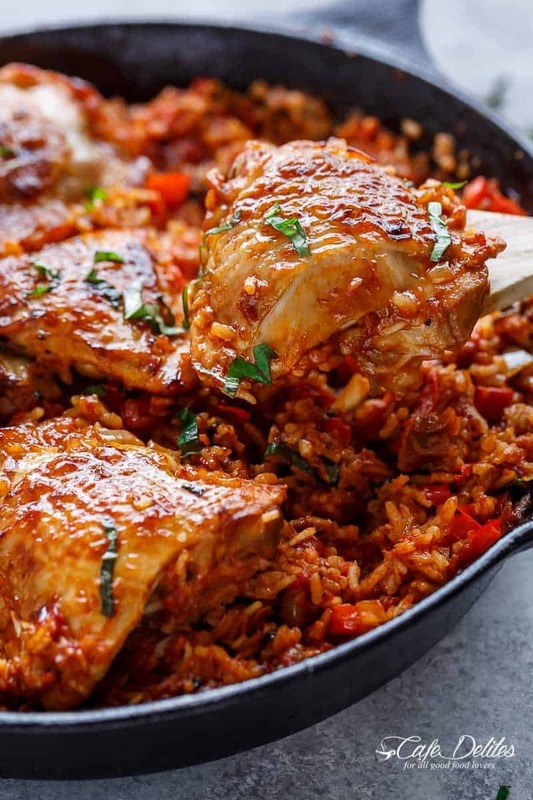 Crispy chicken bakes over a bed of tomato basil rice in this One Pan Tomato Basil Chicken & Rice. Dinner is ready in 45 minutes! All made in one pan and so easy to prepare, you won’t believe it when it’s done. No rice cookers and no extra pans needed! Tomato Basil Chicken & Rice has the most popular vote for dinner in my house! Back up a second. Let me rephrase. Chicken SO crispy on the outside; tender and falling apart on the inside; tomato, basil rice with so much flavour and cooked in so.much.sauce. Chicken broth, tomato juices and chicken flavours, mixed through with chopped tomatoes, fresh basil leaves AND the addition of sun dried tomatoes if you so desire. 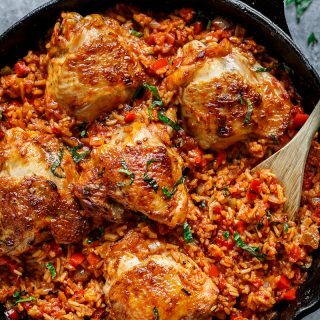 This Italian inspired recipe comes from this One Pot Italian Chicken and Rice recipe from so long ago. An even BETTER version times a thousand! I have no doubt in my mind you will fall in love with THIS ONE. 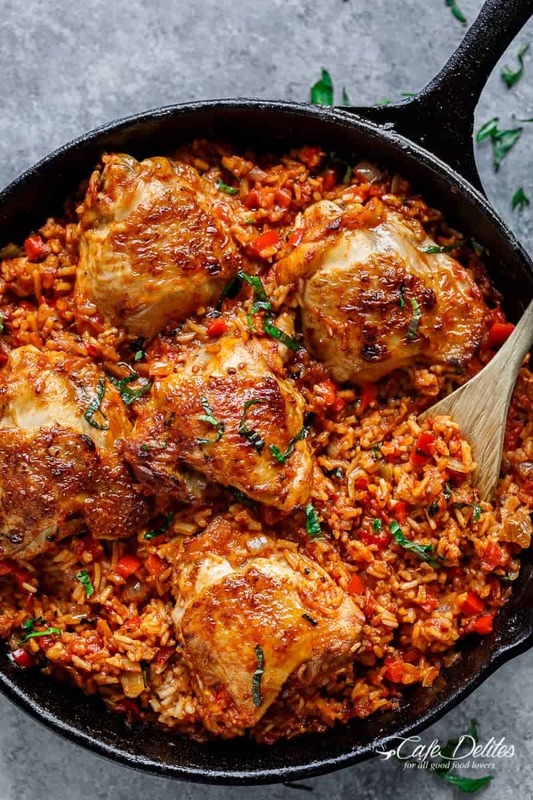 This recipe calls for a skillet, but if you don’t own one you can a normal pan to sear your chicken in over stove top, add the rice and the rest of the ingredients, then transfer everything to a large 9×13-inch baking dish. 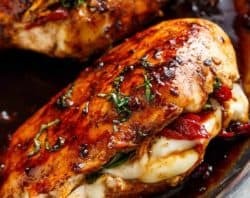 You can use bone-in, skin-on chicken breasts if you don’t like thighs. 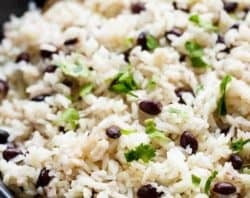 The recipe is the perfect rice to liquid ratio when using white rice. If using brown rice, you will certainly need up your liquid. I have not tried this recipe with brown rice, so I cannot give you any advice. Chicken thighs are crisp-tender and juicy, cooked WITH the rice in one pan to minimise cleanup! You are SO welcome! One Pan Tomato Basil Chicken & Rice on VIDEO! 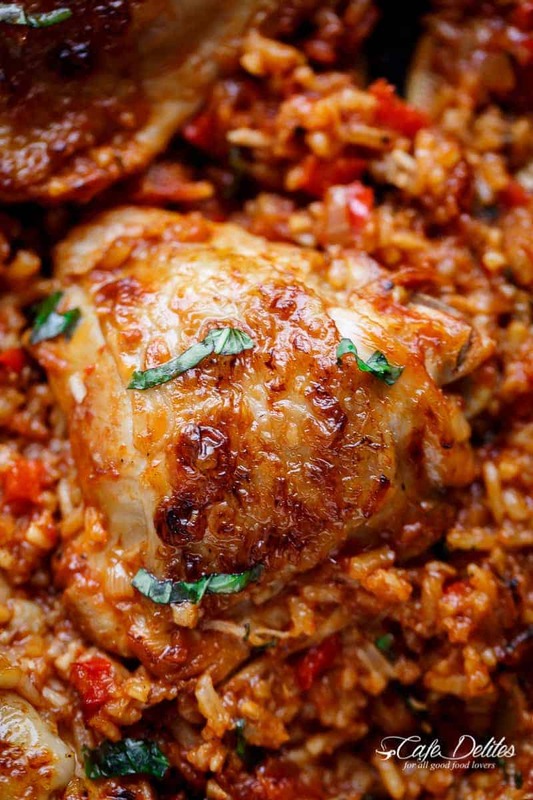 Crispy chicken bakes over a bed of tomato basil rice in this One Pan Tomato Basil Chicken & Rice. Dinner is ready in 45 minutes! All made in one pan and so easy to prepare, you won’t believe it when it’s done. No rice cookers and no extra pans needed! Preheat oven to 200°c | 400°F. Heat the oil in a large, deep ovenproof cast iron skillet/or pan (over 30 cm or 12-inches). Add the chicken, skin side down; sear for 3-4 mins on medium-high heat. Turn each thigh and sear until golden all over. Transfer the chicken onto a warm plate. Add the garlic; fry until fragrant (about 30 seconds). Add the onion and red peppers / capsicum; fry for about 3 minutes or until and onion is transparent. Stir in the sun dried tomatoes, rice, crushed tomatoes and chicken broth (stock). Season with salt, pepper and dried basil. Bring to a simmer and allow the rice to soak up all the tomato flavours. Place chicken thighs, skin side up, over rice. Bring to the boil; rotate the chicken in the tomato sauce to coat; cover with foil; transfer to preheated oven and allow to bake for about 40 minutes, or until the rice has softened and absorbed the liquid and the chicken is cooked through. Stir through an extra 1/4 cup of water to the rice ONLY if needed (if rice hasn't cooked fully). Remove cover; change oven settings to broil / grill on medium heat for a further 8-10 minutes or until the chicken is crispy and golden. Season with extra salt to taste; sprinkle with freshly chopped basil to serve. Thanks for a great recipe! I made this today. So delicous! Since i hade celery and mushrooms i added them to the other vegetables. Some grated parmesan on the top made this dish a complete success! 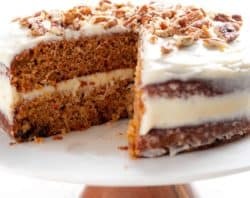 Karina, thank you sooo much for sharing this recipe. I’m grateful I found you on Pinterest and signed up for your newsletter. I made this recipe exactly as you printed it and it is perfect!!! The combination of ingredients and liquid to rice ration are PERFECT!! I brought leftovers in for my co-workers to try and they liked it as much as I and requested the recipe. Looking forward to trying more of your creations. Thank you, again. I hope you have a Merry Christmas and Happy New Year!! Made this tonight and it was delicious! Used boneless, skinless thighs and had no fresh basil but everyone loved it! I am so glad that you all loved this meal! This is one of my very favorites. Thanks for taking time to comment and for following along with me! Found this recipe when I googled thighs, rice, and stewed tomatoes, trying to find something for dinner. Only had dry basil, and no sun dried tomatoes, but it still came out great for an easy family dinner. I now make it once or twice a month. I wouldn’t hesitate to serve this for a casual dinner party, either. This was very nice. Reminded me of something my grandmother used to make when I was little. An absolute keeper. Holy smokes is this good. I needed to make for five with three teenagers so kind of doubled it. Don’t have a skillet big enough so I used a non-stick roasting pan on the stove with three burners going to get the chicken seared and it.was.perfect. we added a bit of saffron right before the broil and it was over the top! Can’t wait to make this again to impress someone. Yummy! Did a variation of this tonight, except I used boneless, skinless chicken that had been soaked in brine for a couple of hours beforehand. I also had the rice start out dry in the bottom of a glass casserole dish and covered it and the chicken with the liquid tomato mixture, so it did need two pans (mostly out of necessity, I don’t own an oven-suitable frying pan). It earned the German mum-in-law seal of approval, which comes down to her saying “terrible, must be destroyed,” and making short work of it, plus going back for seconds, so I think I’ll be making this again very soon! That is awesome to hear! I am so glad that it was approved and that you made it your own! Thanks so much for sharing! 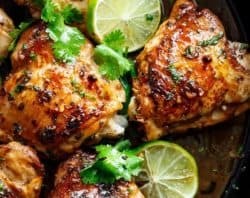 Can I use boneless skinless chicken thighs instead of skin on and bone in? Hi Marta! Yes you can! I’d bury them amongst the rice and liquid in the pan so they don’t dry out too much while baking. I made this last night and my family loved it. Very easy to make. Great flavors. We used long grain brown rice – needed a little extra chicken broth and time in the oven but otherwise turned out great! Thanks for the recipe. I made this recipe tonight and it was delicious. I didn’t have a cast iron so I made everything on the stove top as directed but then transferred to a 9×13 Pyrex to stick in the oven. I kept all the baking directions the same and it turned out wonderful. Just had an extra dish to wash. Also the basil at the end is necessary for peak deliciousness. I added extra garlic because I also do lol. I used a 24 oz can of peeled tomatoes (with liquid) and 2 cups of rice, came out perfect! Hi, i had query infact. My microwave is not working. So what should i do with the oven part. How can i furthr cook on gas or stove?? Made this for dinner tonight and loved it! I was a little worried the rice wouldn’t be cooked because I used brown Basmati rice (I thought I was buying white), but it turned out perfectly, I also used diced tomatoes instead of crushed and didn’t have any fresh basil to add, but it was still delicious. Thanks for posting! I’m so happy to hear that Celia! Thank you so much for stopping by to share your feedback! I don’t have a cast iron skillet. Could I make this on the stovetop, then tip it into a pyrex glass casserole dish & cook it in the oven? Would I cook it for the same length of time? 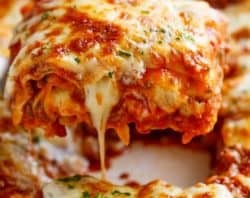 How to make in a crockpot? I made this a few days ago using fresh tomato puree and a bit of tomato paste. It was delicious and full of vibrant flavours! Will definitely make it again. This was the first time I made this dish and it turned out excellent! The only thing is make sure there’s enough liquid for the rice so that none of it will be crunchy. Had this tonight for dinner. Very simple recipe that made a very tasteful and satisfying dish. Will definitely have again. Only thing we did differently, was excluded the peas. Yummy!!! This dish is really good. I’m a guy who can’t cook but I followed the recipe as close as possible. If you like tomato flavors, then you will like this dish a lot. just made this tonight and it is so so YUMMY! easy and quick and just perfect for the fall weather that has come suddenly in vancouver! 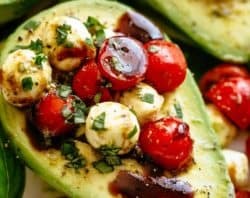 make sure to add the sun-dried tomatoes, they are so flavourful in this dish! Can’t wait to try this. Making it tonight. One question…for future, have you tried this in a slow cooker? Does it turn out? 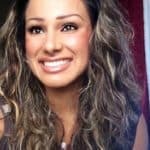 Hi Tamela! No I haven’t tried it in a slow cooker, but I will now! I made this over the weekend, and I’m curious what size skillet you used. I have a 12″ cast iron skillet and it was full to the top before I added the chicken back in. I had to split it out, and put part into a 9×9 Pyrex baking dish to make it all fit without overflowing. Otherwise, it was a delicious dish and I’d make it again, for sure! Laura! Mine is 15-inch! Ah I’m so sorry I should have included that in the recipe. I’m glad you liked it though! Making this dish tonight! Looks tasty.